Frederick Law Olmsted and Calvert Vaux’s original design for Central Park did not include any monuments. The designers broke from the European precedent of formal parks and gardens embellished with statues and monuments and conceived of the Park as an idealized rural landscape. Their goal was to create the experience of the countryside amid a rapidly growing city; they designed features such as bridges, buildings, and fountains to support the experience of woodlands, meadows, and lakes. Bethesda Terrace was the only area the designers designated for public art: it featured Angel of the Waters and the Arcade, with its intricate carvings and tiles. While Central Park was immediately a popular destination for such activities as strolling and ice skating — and was celebrated as a groundbreaking park design — it did not reflect everyone’s conception of what a public space should be. 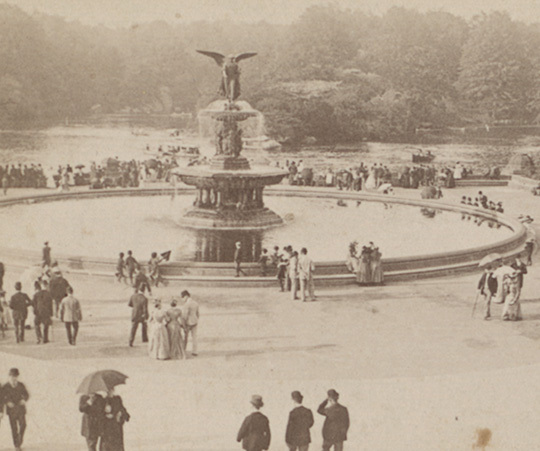 Soon after Central Park opened, New Yorkers began proposing a variety of additions, including monuments, and even donated works of art and other objects, some of which the Park’s administrators attempted to reasonably accommodate. (The donation of numerous live animals ultimately led to the creation of Central Park’s first zoo.) Most monuments were proposed by citizen’s groups, often European immigrants who sought to see themselves represented in the City’s premier public space. 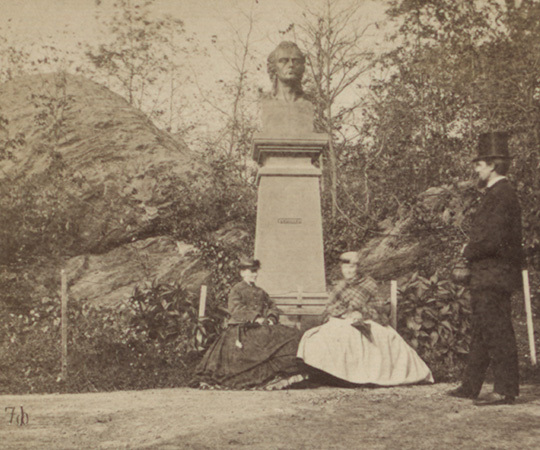 The German-American community donated Central Park’s first monument, a bust of Johann Christoph Frederick von Schiller — the philosopher, poet, and playwright. It was installed in 1859 in the Ramble because of Schiller’s love of nature. Source: New York Public Library. The policy also included clear guidelines as to where monuments could be installed in Central Park. Administrators considered entrances, because of their status as thresholds between Park and City, as ideal sites. They hoped to relate the content of statues to the entrances, which were named for the people and professions of the City — artists, merchants, scholars, engineers, women, children, and others — to reinforce the idea that Central Park existed for all the citizens of New York. Park administrators identified the Mall as the other suitable location. With its straight and wide promenade leading to the Concert Ground and Bethesda Terrace, it was a formal landscape designed as a social space and a place of contemporary culture, and therefore more accommodating of works of art than Central Park’s more naturalistic landscapes. Most monuments in Central Park were installed along or near the Mall and along the perimeter. (The idea of relating the statues to the named gates, an attempt to make the process more democratic, never really took hold.) By the end of the 19th century, Central Park was home to 26 statues, 18 of these commemorative monuments. Along the Mall, the installation of Scottish writers Robert Burns (left) and Sir Walter Scott (right) as well as Shakespeare and the poet Fitz-Greene Halleck sited nearby led this section to be known as Literary Walk. Source: New York Public Library. The monuments and sculptures installed in Central Park during the 20th century represented changing ideas about public art, as well as growing concern about the impact of additions on the experience of the Park. Some were stone benches dedicated to individuals, a form of commemoration that was more compatible with traditional park use. 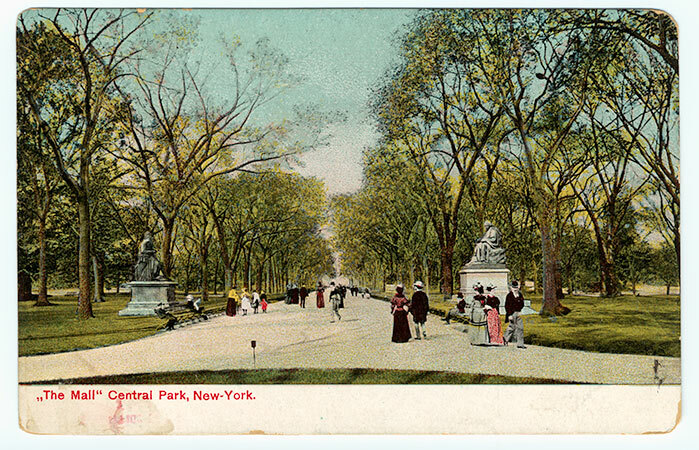 Principles of Beaux-Arts city planning influenced the redesign of Central Park’s southern entrances with monuments and memorials, resulting in Grand Army Plaza and Columbus Circle. Under the administration of Parks Commissioner Robert Moses beginning in 1934, the Parks Department accepted donations of playful statues of animals and statues inspired by fairy tales, some of which were located near playgrounds and other spaces popular with children. These adhered to the idea of Central Park as a place for leisure and play, and were also evidence of declining general interest in traditional monuments and memorials. 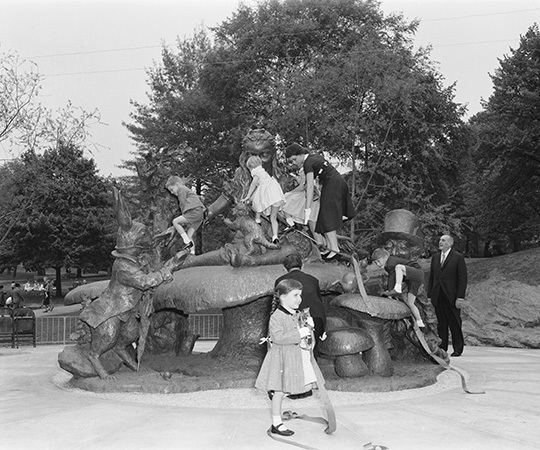 Alice in Wonderland, one of Central Park’s most beloved statues, was donated to the Park by George Delacorte in honor of his late wife, Margarita, and installed in 1956. Commissioner Robert Moses is depicted on the right. Source: NYC Parks Photo Archive. By the mid-1960s, the burgeoning citywide preservation movement — along with concerns about Central Park’s deteriorating condition — led to growing vigilance and protests over proposed additions. The recognition of Central Park’s enduring cultural, recreational, and historic value led the National Park Service to designate Central Park a National Historic Landmark in 1965. In this year, the last commemorative monument was installed in the Park, a statue of the Cuban intellectual and political theorist José Martí. In 1973, the City’s Landmarks Preservation Commission designated Central Park a scenic landmark, the first designed landscape to be given this distinction. This formalized a process for regulating changes and additions to Central Park and helped to catalyze the movement to preserve and restore it, which culminated with the formation of the Central Park Conservancy in 1980. The Conservancy’s work in Central Park includes the repair and conservation of the Park’s art collection. 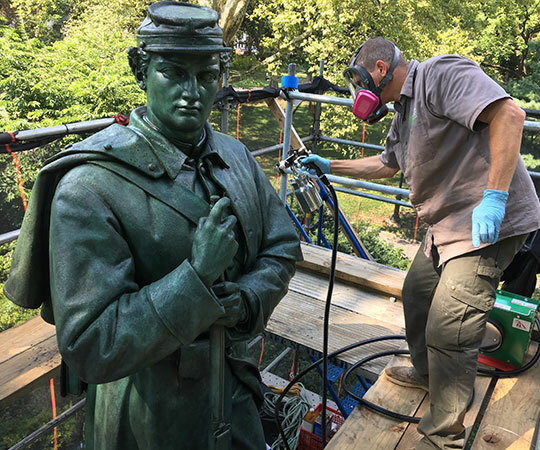 In 2017, the Conservancy performed a conservation treatment on the Seventh Regiment Memorial, which honors the 58 members of the Regiment who lost their lives during the Civil War. In the interest of preserving Central Park and its primary purpose as an experience of landscape and retreat from the City, no new monuments have been added since the Park was landmarked in 1965, although there have been numerous temporary art installations. (The Imagine Mosaic, part of Strawberry Fields, is the only permanent work of art added since.) Monuments have been added to land that is separate from, but adjacent to, Central Park. In 1997, the City opened the redesigned traffic circle at the Park’s northeast corner featuring a monument to Duke Ellington. In 2010, in collaboration with the Conservancy, the City completed a project at the northwest traffic circle, a pedestrian plaza featuring a monument to Frederick Douglass. Duke Ellington Circle and Frederick Douglass Circle were major projects that aimed to better connect the northern section of the Park and the adjacent neighborhoods, and to honor these African-Americans and their contributions to history. 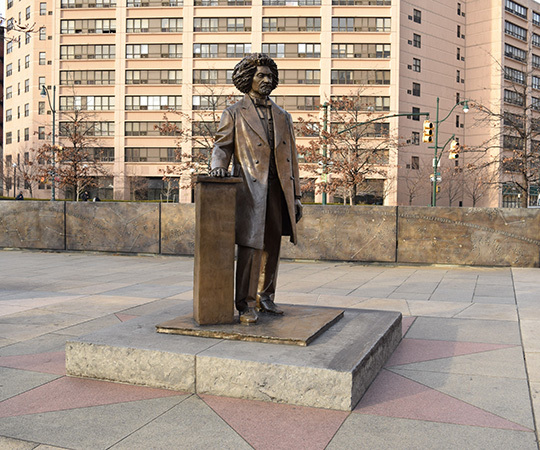 The statue of Frederick Douglass at the northwest corner of the Park is part of a larger monument, dedicated in 2010, that encompasses the entire pedestrian plaza at Frederick Douglass Circle.